Lotus and its founder Colin Chapman are legendary, especially in Formula 1 racing circles. Chapman perfected the lightweight, fully stressed monocoque chassis and rear-engine design that revolutionized open wheel racing, both F1 and Indy Car, in the 1960s. Under Chapman’s guidance Lotus won seven world constructors championships in F1 and six world driving championships with the likes of Jim Clark, Graham Hill, Jochen Rindt, Mario Andretti and Emerson Fittipaldi. But after Chapman’s death in 1982 the Lotus team slowly declined and exited F1 in 1994. But the Lotus name returned to F1 in 2010 and in 2012 the Lotus Renault Team became Lotus F1 Team, carrying the former Team Lotus’ vintage black and gold racing colors that it ran in the 1970s and 1980s when it was backed by tobacco firm John Player. It’s no longer strictly a British team, being owned by Luxembourg-based Genii Capital, a venture capital group. This team started its life as Toleman Motorsports in 1981, with its headquarters in England, but has undergone several re-inventions of itself, along the way picking up backing, and engines, from Renault. 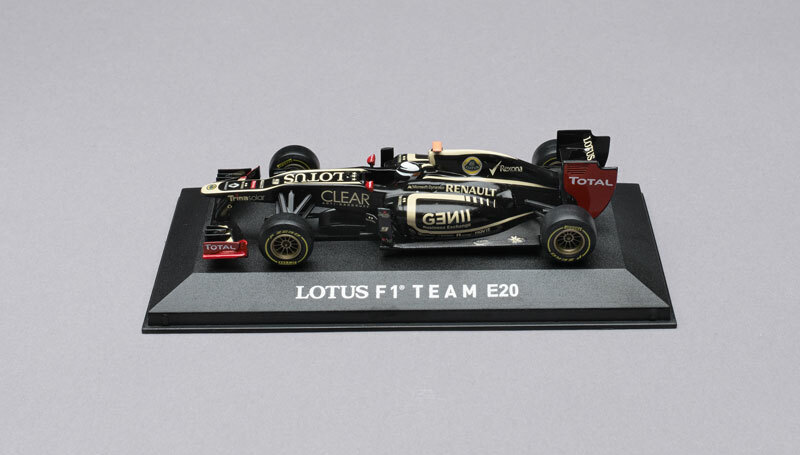 That’s a short history of what brings us to Corgi’s smartly executed 1:43 version of the Lotus E20, raced in 2012 by former F1 champion Kimi Raikkonen of Finland. 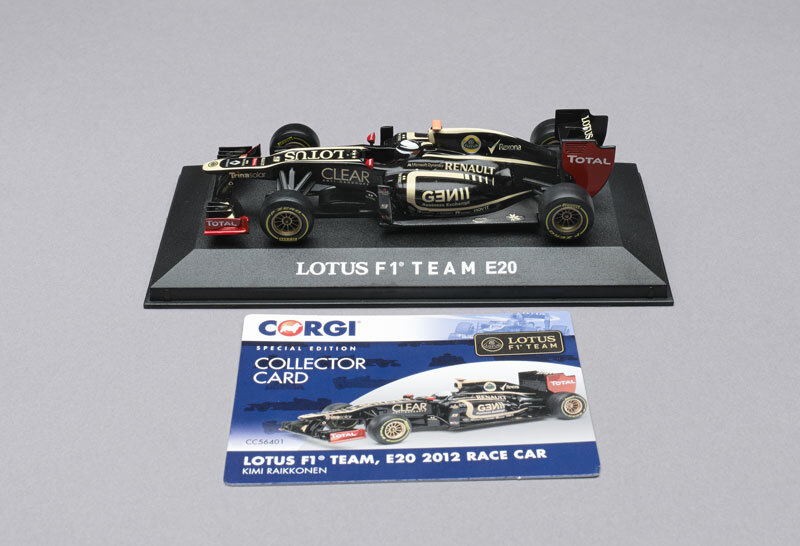 Corgi delivers a beautifully rendered Lotus, and also offers the team car driven by France’s Romain Grosjean in the 2012 season. This is part of Corgi’s Lotus Collection that consists of racers and street cars created by, or branded, Lotus. The F1 cars all come in a sturdy plastic case for easy display, and an attractive cardboard sleeve protects the box and includes the Lotus logo and a photo of the actual race car. In this scale some models can become a little sloppy or simplistic, but this black and gold Corgi model offers good detail at somewhat of a value price. Many high-quality cars in this scale now go for $60, or more. This one has detailed front wings and diffusers, the hallmark of modern F1 cars, plus all the logos, such as Lotus, Renault, Genii and Total, that cover today’s racers. The Lotus E20 looks authentic and offers well marked Pirelli P Zero slicks and nicely detailed, albeit gold plastic, wheels. I particularly like the red end plates on the car’s front and rear wings that give this a bit more flair than its overall colors. The 1:43 model also comes with a collector card. There also are small red mirrors beside the driver’s cockpit, which features a driver figure with a helmet bearing Raikkonen’s design. The model has a steering wheel with some detailing on it, but it’s all black with no buttons highlighted. The car’s shape, paint scheme and aero features are all here too. The real racer packs a 750-horse V8, hinted at by the Renault logo on the engine cover, but there is no engine under this bonnet. Such detail would push the price point beyond what many collectors would want to pay.The suspension pieces are black plastic, but you’ll barely notice as they blend in well with the car’s black paint scheme. Put it on a shelf for display and no one will be the wiser. 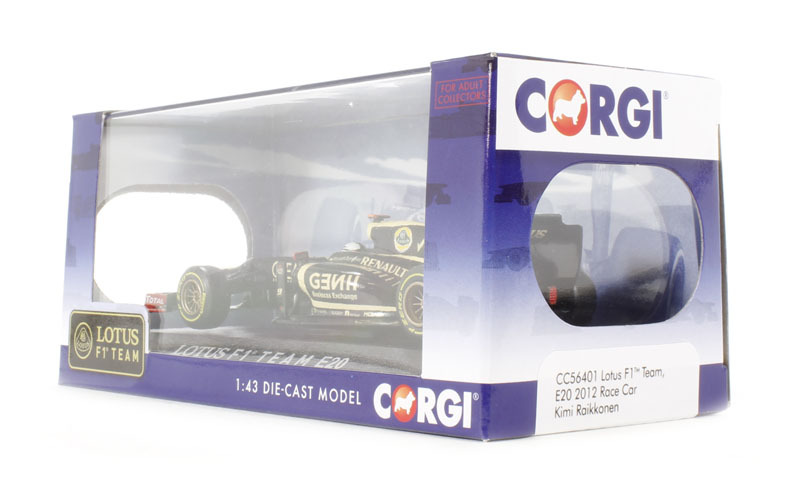 Corgi offers this value-oriented model aimed at F1 fans, the number of which may be growing due to the extensive coverage of F1 racing on the NBC Sports network these days, plus the U.S. Grand Prix now held each fall in Austin, Texas. If you’re a Lotus devotee, this will make a nice, and relatively inexpensive, addition to your collection. Or if you’re a Kimi fan – “Leave me alone, I know what I’m doing!” – you’ll want this one too!